BBC NEWS | UK | England | Is the South East prepared? Is the South East prepared? For any terrorist looking to make an impact on mainland Britain, the South East makes for a tempting target. The nine-county region surrounding London has eight million people, seven cities with populations of more than 100,000 and a host of shopping centres. With 24% of the country's total motorway network, the UK's second busiest airport - Gatwick - the Channel Tunnel and a number of major ports and docks, its importance as a transport and communications centre is obvious. Added to that is a wealth of military targets - including Portsmouth naval base, the "home of the British Army" in Aldershot in Hampshire and the Atomic Weapons Establishment in Aldermaston, Berkshire. It is not just an attack on their own patch that concerns emergency planners, but also the knock-on effects of a chemical, biological, radiological or nuclear (CBRN) attack in the most likely target, London. Operation Sassoon - last resort plans for the mass evacuation of the capital - would see an influx of thousands of people into the Home Counties, needing temporary shelter, food and water. With so much on their plates, planners across the South East admit that without regional co-operation they would be floundering. 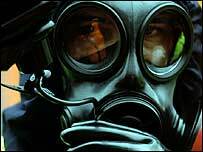 Richard Searle, contingency planning officer for Thames Valley Police, helped oversee one of Britain's biggest exercises to train troops and emergency services to deal with a chemical attack. The exercise, codenamed Autumn Roebuck 2, saw nearly 900 soldiers, police, firefighters and paramedics from across the region descend on Dalton Barracks, near Abingdon, Oxfordshire, in November. Mr Searle told BBC News Online: "It's fair to say we are probably more prepared than others but slightly less prepared than the Metropolitan police, simply because we have fewer people. "We cannot cope with anything other than a minor incident on our own. We would always be looking for assistance. 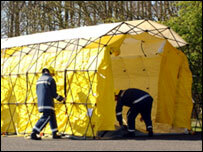 "The minimum distance cordon round a CBRN site is 400m. Simple mathematics tells you we are talking about hundreds of officers. "That's why all our planning is done in a regional context." The regional ramifications of an attack anywhere in the South East is long-accepted in Portsmouth, where the Royal Navy has almost two-thirds of its surface ships and employs up to 14,000 people. Alasdair Hogg, emergency planning manager for Portsmouth City Council, said: "The naval base is very much integrated into the city. "If you were to shut the naval base you would have to shut Portsmouth, full stop. "And with the car park that is the M27, we would have to shut down the whole of southern England. "The naval base has repercussions regionally. "For any terrorist, it's a great little thought for them." Both Mr Searle and Mr Hogg agree the level of funding available to them is a constant concern. But, they add, there is only so much the authorities can do to prepare for an attack that could come at any place, in any form. At the Channel Tunnel, emergency exercises involving crews from the UK and France are conducted on an annual basis, while similar full-scale drills are carried out at Gatwick Airport. For Jim Parrott of the East Sussex Fire Brigades' Union, such exercises have proven useful for exposing potential weaknesses. An exercise similar to Autumn Roebuck 2, which he helped audit when it took place in Sussex in April, revealed a number of flaws, he said. 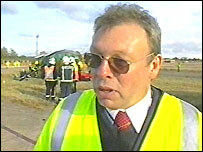 "It took nearly four hours before we were set up and ready to decontaminate the first 'casualties'. "In the real world, most people would have gone home well before we were ready to help them. "Combine that with the fact different agencies use different radio frequencies and often can't communicate with each other, and it's all just a red herring giving people false reassurance. "I think we would be better off making sure people understand the dangers of toxic materials so they don't take them home to their families." 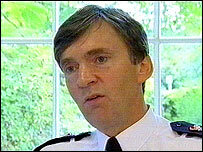 Public vigilance is a message Ken Jones, Chief Constable of Sussex Police and the Association of Chief Police Officers' national lead for counter terrorism, is only too keen to stress. He told the BBC: "Confident community, good law enforcement and intelligence actually sends a message to the opposition that maybe the UK is not a good place to operate." But Mr Jones is wary of following the American model of putting out regular alerts and a constant stream of information. "Having just been to the States, I think there is a bit of alert fatigue there. "You can't keep crying wolf day after day after day and expect people to be in a constant state of vigilance - it just isn't viable." Bill Whitlock, chair of the South East branch of the Emergency Planning Society, added: "There is a fine dividing line between information that is helpful and an overkill of information that tends to veer towards panic." Yet Mr Searle has seen for himself first hand the benefits of a well-prepared society. "I have recently come back from Florida. I went out the day after Hurricane Charlie struck. "I was gobsmacked at the sort of knowledge ordinary people in the street possessed about evacuation procedures. "We are quite a resilient nation as long as we know what to do and what's happening," he said. Despite concerns shared by many in his area of work, Mr Searle is confident in the state of preparation in the South East, not just professionally but as a father too. He said: "I have two young children, aged seven and nine, and I can say I am content we have done the best we can." This article is intended as an overview for the South East region. For further information visit the related internet links on the right hand side of the page.